Kerosene heaters offer an efficient and financially-friendly solution to users who need to regulate the temperature in a specified area without using very much electricity. If you’re looking for a kerosene heater, there are a few things you will want to know; not all heaters are created equally. Heater BTU (British thermal unit) ratings can greatly vary and understanding how to properly care for, store, and operate a kerosene heater is essential. For that reason, we’ve combined hours of in-depth research to bring you a list of some of the absolute best kerosene heaters available. If you need to heat a large space on a budget and may need to use different fuel types, the Mr. Heat MH210KTR may just be perfect for you. These space heaters have been designed to heat very large areas quickly and efficiently for less. The Mr. Heat F270385 heats areas of up to 4,375 sq. feet. and runs for up to 10 hrs. at a time on a full tank of fuel. This means that you can save a good bit of money on fuel costs and not have to worry about setting up multiple heaters in large spaces. Whether you’ll be using it on a construction site, in your airplane hanger, in a shop, in your garage, or anywhere else, this heater delivers powerful temperature regulation and extreme convenience with minimum effort. This Kerosene forced air heater has been equipped with fully enclosed motors, high output components, and large controls that are easy to use, even if you’re wearing thick gloves. The Mr heater contractor series model also comes with large wheels so you can move your heater from place to place as needed. Additionally, all Mr. Heat F270385 models come equipped with multiple safety features like high limit safety switches and photo CAD cells. This means that you’ll have more peace of mind and be able to focus on the task at hand. Knowing that this unit can shut itself off in unsafe conditions is definitely helpful. These heaters also work with multiple fuel types. They can be run off of kerosene, diesel, and more. Whatever your job site requires, these heaters can deliver. That being said, if you are looking to heat less square feet in a smaller space, this may not be the best choice. These large and powerful heaters are ideal for industrial spaces, but won’t work as well for cabins or other small areas. Also, keep in mind that this heater requires a 15 VOLT AC outlet. Powerful – This is a powerful heating solution with high output motor components. Mobile – The dual-wheel design makes this kerosene heater easy to relocate and move as needed. Fuel Efficient – A full tank will burn for up to 10 hours depending on the fuel type you choose. Multiple Fuel Compatible – You can use this heater with kerosene, diesel, jet fuel, and more. Automatic Shut Off Features – The automatic safety shut-off features of this heater will let you put more focus on the task at hand and help you to worry less. – The large and bulky design and high heat output will not work well for small spaces. – You must plug this heater in to an AC outlet with a cord. 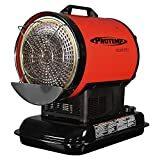 Verdict: If you need to provide heat to a large area and don’t want to buy multiple kerosene heaters, this is a good option. It has two wheels that allow it to be easily relocated and can run off of a wide range of fuel types ranging from kerosene to jet fuel. It also has safety features that make it easier to use and more convenient than many similar models. On the other hand, if you need to heat a small area, this may not be the best choice. It’s just too large. It also must be plugged into a standard 115 VOLT AC outlet. All around, this is an efficient heating solution for large industrial workspaces, job sites, or shops. We consider the Mr. Heat MH210KTR to be the best kerosene heater for larger spaces as well as the most heavy duty heater on our list. 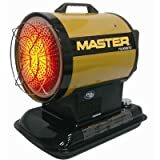 With a unique ceramic burner housing, an easy lift handle for quick transport, a fuel cap that can be replaced and removed effortlessly, and an innovative cooling fan, you’d think that this heater was designed to be used by professionals. You’d be right. The ProTemp PT-80-OFR is perfect for construction sites, mechanical shops, warehouses, large barns, and other industrial areas. It’s been constructed to be extremely durable and dependable. You can trust that this powerful radiating heater can warm an area of 2,000 sq. feet with ease. It’s also pretty quiet considering how large it is. It is easy to operate as well. If you want to warm up a large space but don’t want to have the noise of a forced air heater, the ProTemp PT-80-OFR is a fantastic solution. Other impressive features include the 1-year warranty, attachable safety guard to help protect the ground from overheating, the easy to read fuel gauge, and the 6 hour burn time. This heater even runs on various fuel types. Warm up your space without waking up the whole neighborhood with this 80,000 BTU beast. Keep in mind that there have been some complaints about the fuel pressure levels with this heater. Additionally, in extreme temperatures, the ignition may take a few tries to catch. Other than that, this is a tough and durable heating solution for large spaces. Tough – The ceramic and steel construction of this heater make it a very tough and durable choice. Reliable – With constant radiant heating of around 2,000 sq. feet, you can trust that this heater is up for almost any job. Versatile – The unique ceramic burner housing and easy lift handle make this a great option for garages, shops, construction sites, and more. Ignition Issues – If it’s super cold out, you may have to turn this heater on and off a few times before it works. Fuel Pressure Complaints At the time of this review, there were user complaints about fuel pressure issues that caused leakage with this unit. Verdict: This is a durable and well-built kerosene heater that can heat large spaces with quieter operation than a forced air heater. It has been built using ceramics and steel for longtime wear and operation. It also is a radiating heater that can be moved with an easy-grip handle. The cooling fan works well and the fact that you can use multiple fuel types with this unit is another definite bonus. While there have been a few pressure complaints and in extreme temperatures, ignition complaints, this heater is generally reliable and powerful. It’s a great option for industrial workers or warehouse owners. 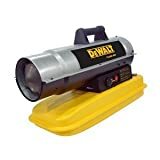 This forced air heater by DeWalt sports a rugged two-piece split barrel design which makes both maintenance and cleaning safer and easier. It has an easy-to-grip and ergonomic handle for transporting as well as recessed controls and a thermostat regulation center. This helps to reduce the risk of damaged knobs and valves on a job site or outside. The continuous electronic ignition is available as a source for fuel that hasn’t been consumed which aides in the ability for this heater to reduce pooled fuel. The build quality of this model is of better quality than many similar kerosene heaters. It works well immediately out of the box. It blows a lot of heat and can be aimed in the direction that you need the most warmth. It also regulates the temperature of an area quickly and effectively. It’s the type of heater that performs on and on without stopping or slowing down. The instant start features are handy and it is also a very durable model. You’ll be able to use the DeWalt DXH75KT every day on a job site without having annoying problems or frustrating issues. All around a quality option for certain outdoor applications, garages, shops, non-insulated areas, and poorly sheltered job sites. As far as drawbacks go, this heater has no thermostat override option. This can be frustrating if you’re planning on using it for drying purposes. It’s a simple and hardy heater that can be used to warm up many different spaces. 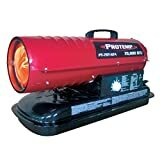 Durable – This is a durable and hardy kerosene heater that can stand up to daily use on a job site. Good Design – The design of this heater makes it easy to operate. Forced Air – The forced air projection allows for fast and through temperature control. Split Barrel – The split barrel that this heater has makes it easy to clean and get inside of when necessary. No Thermostat Override – Since there isn’t a thermostat override feature on this thermostat, you can’t make it run or get extremely hot for drying purposes. Verdict: If you need a safe and durable forced air heater for a job site, this is a great option for considering. It has a rugged design that makes it outlast other models. It also tends to stand yo well to wear and tear and can be used every day without having problems. However, if you need a super simple heater that can be used for drying, this isn’t the best option. It has no temperature override features so it can’t be run continuously. Still, if you need a safe and easy to operate heater that’s rugged and starts fast, the DeWalt DXH75KT is a good choice. For users needing something that gives off a lot of heat in all directions and operates more quietly than most kerosene heaters, you’ll want to check out the Master MH-70-SSA kerosene heater. The large front heating face of this heater means that heat is spread out farther in an efficient and effective way. It’s also about 75% quieter than many similar forced air kerosene heaters. It burns pretty clean as well and doesn’t have too much of a smell. A definite bonus for users heating shops and garages. It can heat up a large uninsulated garage to around 65ºF in about an hour in exterior temperatures of -10ºF or less. This heater will not work well with any type of plug-in style thermostat, however. After heating it must go through a cool-down cycle and using a plug-in thermostat will prevent this process and ruin your heater. It can also run on multiple fuel types which is helpful for cost saving. Choose from kerosene, diesel, or oil fuel for this heater. For very large workshops, two of these heaters would work well to heat the entire space. Additionally, the hot shield feature is nice for safety and the blower remains on after you’ve turned it off so you don’t waste or lose any heat. This is a really efficient heating solution that would work for many different types of applications. You may find that this heater needs to be turned off after only an hour or so, it tends to radiate more than enough heat for most small to medium-sized spaces. Wide Face – The wide face and radiating design help this heater fill large areas with heat quickly and efficiently. Dual-heating Capabilities – Since this heater radiates warmth and has forced air, it creates a dual-heating factor for efficient and fast heat that lasts. Easy to Use – This heater is simple to use and operate. Multiple Fuel Types – You can use multiple types of fuel such as kerosene and diesel with this heater. Not Plug Thermostat Compatible – This heater will not work well with plug in thermostats as it requires adequate cool down cycling after use. Might Be Too Hot for Some – This heater may get a bit too hot for some smaller spaces; you may have to turn it off after an hour or so. Verdict: If you need a powerful little heater that radiates warmth in a big way, this is a good option. Its ide open face allows for fast and efficiently spread heat while the forced air components help to ensure that heat is pushed through every corner of a space. It can be run with multiple fuel types and has an efficient and easy to use design. If you have a very small space, this heater may actually wind up being a bit too powerful. It would be best suited for garages, medium-sized shops, small job sites, and other similar places. The main selling point of this heater is its silent operation. This heater is very quiet and easy to have a conversation next to. There are no loud fans or whirring motors. It has a simple and easy to understand design that is also very energy efficient. Compared to a standard forced air kerosene heater, this heater is nearly silent. It doesn’t emit a high pitched whine or constant low buzz either the way that some radiating heaters do. In addition to this, the Mr. Heat Corporation MH70KFR has a very low scent emission. It doesn’t smell like fuel or fumes the way that some other kerosene heaters may. It can heat a 32×32 1000 square feet room in about an hour. This heater uses less energy than many other electric heaters, and can also run off of diesel making it a versatile option. It does, however, require electricity to run so this is not the best option for camping or traveling to areas where electricity isn’t easily accessible. Additionally, the cooldown cycle of this heater is a bit odd. It has a 3-minute cooldown cycle that doesn’t always kick in properly. Finally, you’ll want to keep in mind that since this isn’t a forced air unit, it gets very hot. You’ll want to be careful as you near it. Still, if you need a silent radiating kerosene heater for a cold space sub-par ventilation, this is a good option. It’s fairly efficient and can be used with multiple fuel types. Though this heater doesn’t have a very strong odor, you will still need to be sure that the area you’re using it in has proper ventilation. Quiet – This is a very quiet unit that can be used in smaller spaces. Low Odor – The scent of the Mr. Heater Corporation MH70KFR is less noticeable that of many similar kerosene heaters. Easy to Use – This heater is pretty easy to operate, start, and clean. Verdict: This is a quiet radiating heater that doesn’t emit much of an odor. It would be a good option for someone needing a kerosene heater to warm a smaller space like a garage or shed. It also can be used with diesel fuel and other fuel types so it’s versatile and efficient. It does have some issues with the cool down cycle and can get very hot. Keep this in mind and be careful if you decide to go with this heater. 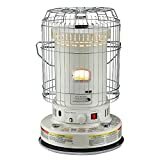 All in all, this a very quiet and odorless kerosene heater option that is versatile and easy to use. This is a forced air heater that knows the meaning of efficient heat output. It’s extremely portable so you can take it with you to heat up just about any chilly space. The electronic ignition makes starting this heater a simple process. Additionally, the variable heat settings let users get more versatility as they warm up their space. This heater has no problem heating spaces of up to 1125 sq. feet. The state-of-the-art safety features allow you to have more peace of mind as you run this tornado heater. This is a fantastic option for construction sites, garages, barns, warehouses, workshops, and other similar places. It can run on various fuel types other than kerosene as well including jet fuel. To go a bit more in-depth on the features of the Pro-Temp Air Torpedo, it has a variable BTU for heating large areas and can run for over 14 hours on a single kerosene tank. The tank of this heater is about 5 gallons. It works best for outdoor spaces or very well ventilated spaces because of its forced air torpedo design. It’s very easy to move and carry as well and has a wide base that is stable to prevent tipping of any kind. This is a dependable and efficient option that can serve a variety of functions. On the downside, this is not a heater for inside use. It’s pretty noisy and it does have that standard kerosene heater smell. Additionally, this heater tends to need manual configuration and will not always turn back on when the thermostat temperature is low. You may have to turn it up yourself when the automatic features don’t kick in. Other than that, this is a great option that also comes at a pretty decent value. Good Value – For the price, you get a large and efficient heater that’s well built. Forced Air – The forced air design allows for heat projection that’s constant and strong. Versatile – Variable BTU settings, a portable design, and the ability to run off multiple different fuel types make this a versatile option. Dependable – This heater goes for hours and hours reliably year after year. Automatic Thermostat Issues – At the time of this review, there were reported issues with the thermostat of this heater turning off and not turning back on automatically. No Low Profile – This heater is a bit louder and more noticeable than some other forced air heaters; while it isn’t extremely loud or obnoxious, it isn’t the most silent option either. Verdict: If you need a reliable and efficient forced air heater for your shop, garage, warehouse, barn, or other large and ventilated space, this is a good option. It runs for a long time off of a single fuel tank and is also pretty dependable. On the downside, this heater has some automatic thermostat shortcomings and is a bit noisy. Still, for construction or cold spaces with lots of airflows, this heater is a good option that comes at a price that’s pretty decent. When you want to heat a small space efficiently, a kerosene heater such as this one may be a good idea. If you need a powerful indoor heater, this is probably your best option. This particular model has been built with quality components and designed with users in mind. The durable construction and high BTU output make this heater a popular choice among many people. It really is pretty powerful, especially considering its smaller stature. With a 23,800 BTU projection rate, your indoor space will be toasty warm in no time. It also has a 360º radius for heating everything around it. The DH2304S is a great tool to have on hand during power outages. It provides both heat and light simultaneously. If you’re in an emergency, you’ll be glad you have this heater. A newly added no-lift heat chamber design is there to minimize startup smells when you light this heater. This means that that kerosene odor is greatly reduced. This is a simple and compact kerosene heater that can be used indoors and is an amazing option for emergency power outages or for heating a garage or workshop. It’s very important to keep in mind that just because this heater has been designed to efficiently heat indoor spaces, carbon monoxide prevention and ventilation is still very important. You must have adequate airflow in the space that you’re heating. This may require you to crack a window when using this heater. Ideally, you’ll have this on hand as a supplemental heat source. It could also work well for situations like a big old cabin in the mountains with no heater or a drafty concrete basement that’s being worked on. Powerful – This heater radiates heat powerfully for hours. Safety Cage – A large safety cage surrounds this heater to help prevent accidents. Multi-functional – This heater serves as a light and heat source, making it a great option in the event that you lose power in the winter. Needs Ventilation – While this heater has been marketed for indoor use, it still requires plenty of ventilation for safety. Verdict: For emergency situations, this heater is a fantastic option. If you lose power in the dead of winter, you’ll be glad you have it on hand. It’s powerful, easy to use, and functions both as a heater and a light source. On the other hand, this heater is not ideal for indoor applications as its name may suggest. It tends to smoke sometimes so you’ll want to be sure that wherever you use it, you’ve got proper ventilation. Still, as a utilitarian or backup kerosene heater, this is a great option. This heater is an excellent option for emergency situations. It has a pretty extensive heat range. Though it claims to heat 1,000 sq. feet, we recommend expecting a little less. This is especially true if you are using this heater in an emergency. It does, however, heat efficiently and quickly. It also is very simple to operate. The fuel capacity is around 1.9 gallons, so you’ll get hours of heat from a single tank. Expect to have this thing running for around 11 hours before having to refill it. It also has an automatic shut-off so it won’t catch fire. Some of the best applications for the sengoku keroheat are indoor heating for well-ventilated spaces, as an emergency heat source, as a temporary heat solution for places with no electricity, in machine shops, sheds, garages, or other well-ventilated areas with no heat, and for some kinds of camping. This heater also has a siphon pump that can be operated manually for quick and safe kerosene transfer. The fuel gauge allows you to easily read the kerosene levels with this heater and it also includes four D batteries. The Sengoku company has been manufacturing alternative heat solutions for over 60 years so their products tend to have a simple and straightforward design that’s easy to understand and hassle-free. All in all, this is a quality kerosene heater that has been well thought out. Good Design – The straightforward and thorough design of this heater makes it simple to operate and a hassle-free option. Radiating Heat – This heater radiates warmth and covers a large area quickly. Good Fuel Capacity – This heater can hold almost 2 gallons of fuel and also has a gauge that shows you how much kerosene is left. Only Kerosene – This model can not run off of any alternative fuel types; it’s a kerosene only heater. Verdict: A well-built and simple to operate heater, you will be able to warm spaces quickly and with less hassle. The intuitive design and thought out user features make this a simpler option to run. It would be a great alternative heat source solution or could easily heat a workshop, garage, or cabin. Keep in mind that this is a kerosene only heater. It won’t work with diesel or other alternative fuel types. However, the efficient fuel tank can hold almost 2 gallons of kerosene and has a fuel indicator gauge that lets you know when it’s time for a refill. It also runs for around hours off of a single tank. A great kerosene heating option with many potential applications. Another impressive Sengoku product, this little heater is very easy to move from space to space. It’s also simple to operate and a breeze to store. This is an ideal heating solution for emergency heating in rooms of up to 380 sq. feet. It features a large capacity 1.2-gallon fuel tank that can keep a big room warm for up to 14 hours on only one fill. It also has an automatic safety shut off. This ensures that it won’t overheat when you’re not watching it. The easy push-button start makes this one of the easiest kerosene heaters to use as well. You won’t need matches, electricity, or a lighter to start this heater. It also has an EZ flame adjuster, a tip over switch, and protective safety grills for added convenience and peace of mind. The Sengoku HeatMate has a wide range of potential applications. You could set it outside on your deck, gazebo, or patio for heat on-the-go. The new burner design protects this heater from susceptibility to wind or breezes, so it won’t go out accidentally when you’re spending time outdoors. You could also easily take this heater on a camping trip or bring it along for other leisure activities. When you’re done, you’ll have it as a backup in case of a power outage in the winter. The intuitive design of this heater is a staple of Sengoku, an industry leader in alternative heating for over 50 years. The Sengoku HeatMate is simply a great option for a wide variety of everyday supplemental heating and emergency situations. 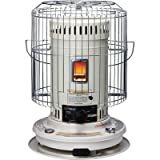 Indoor/Outdoor – The burner of this heater has been designed to resist wind, making it perfect for indoor or outdoor supplemental heating. Safe – Multiple safety features make this heater a great option for just about anyone. Easy to Use – The bust-button ignition and safety features make this one of the easiest kerosene heaters to operate. Kerosene Only – This heater will not run off of diesel or other alternative fuel sources. Indoor Only – This heater will go out in strong winds so you’ll probably want to use it in well-ventilated indoor spaces only. Verdict: If you need a very efficient and economical indoor heater, this is a great option. It also comes at a great price. The Dyna-Glo RMC-55R7 is easy to use, has lots of great safety features, and can burn for hours and hours. It’s perfect for heating up cabins, RV’s or using in other well ventilated small areas. On the other hand, if you need a heater for a porch or patio, this isn’t the best option. It also can’t be used with diesel. Still, for the price, this is a good option that could save you money over the course of time. This Dyna-Glo heater has been designed to prioritize the economy, efficiency, utility, and convenience. The efficient use of kerosene fuel makes this a real money saver. It can easily heat a 500 sq. foot area within an hour or so. It doesn’t require an ounce of electricity to run, either. You can use this heater to warm a space in an emergency or as an alternate heat source. It’s also very easy to use. It has an automatic ignition that lights quickly. It also has an automatic shut off features for safety and convenience. All around, for the price, you can’t go wrong. It’s a great option for safe supplemental indoor heating. On the downside, this heater isn’t very portable. You wouldn’t want to use it outside either, as its burner is susceptible to blowing out with strong wind gusts. Keep in mind that this heater won’t run off of diesel fuel. Still, this heater manages to burn with 99.9% efficiency, making it one of the most economical indoor heaters out there. Also, it comes with the siphon pump and batteries so it is ready to use right out of the box. It can also run for 14 hours off of one tank of kerosene. This is a great option for RV’s. cottages, workshops, cabins, and more. Good Value – This is an inexpensive option, comparatively speaking. Easy to Use – This heater is convenient and easy to operate. Economical – With a 99.9% efficiency rate, this heater makes the most of the fuel you give it. Safe – The automatic shut off features and durable housing components make this heater a very safe option. Kerosene heaters are a fantastic option for a variety of situations. Understanding how to use, care for, and store them properly is a must. Below, we have taken the time to answer some of the most frequently asked questions about these heaters’ Let’s take a look! 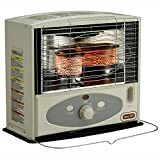 What is the best kerosene heater for indoor use? The answer to this question depends on what kind of indoor space you have. How large of a space are we talking? If you need to warm up a camper, for instance, the Dyna-Glo RMC-55R7 is a great option. If you have a larger indoor space, you’ll want a powerful heater like the Dura Heat DH2304S. There are many indoor convection kerosene heaters that work quite well. Keep in mind though, even inside, a kerosene heater must have proper ventilation for safety (avoid carbon monoxide production). How to store a kerosene heater safely? Storing a kerosene heater isn’t difficult. Common sense and proper safety procedures must be followed, however. It really is the preparation for storage that will be most important. When you are getting ready to store your heater, you’ll follow a process of removing the fuel from the tank, cleaning the wick, cleaning the heater, and finding a proper storage place. For more on how to store a kerosene heater, check out this article. Additionally, this video walks you through the entire storage and cleaning procedure from start to finish. Keep in mind that the kind of heater you have must be considered. Some heaters will have different preparation and storage procedures. How to stop my kerosene heater from smoking or smelling? If your portable kerosene heater is smoking or smells bad, there could be a number of factors at play. Older heaters were once very sooty and stinky, but modern heaters burn cleaner and tend to be much more efficient. For one, the fuel type you have must be considered. Some kinds of fuel burn cleaner than other types of fuel. Also, the wick and heater design must be considered. Many heaters these days have been designed to almost totally eliminate smoke or fumes. Finally, you must be sure you’re using your heater correctly. Different kerosene heaters will require different operating procedures. Read your owner’s manual to be sure you’re doing everything right. What does “forced air” mean? Forced air is air that is pushed out of your kerosene heater in a direction. There are two main types of kerosene heaters: forced air heaters and radiant heaters. Some heaters are both radiating and have forced air. Generally, radiating heaters fill a space with warmth by radiating heat in a 360º way. Forced air heaters will blow hot or warm air directly in one channel. They can be aimed to maximize heating effects on a certain area. The kind of heater you get will depend on your preferences and specific needs. Additionally, forced air heaters are better for large and well-ventilated areas. You can usually expect to see forced air heaters in large areas like construction sites or very big workshops. When to replace the wick? The wick of your heater will need to be replaced when the manual says that it will need to be replaced. This can vary greatly depending on the wick material, heater type, wick thickness, and other factors. Generally, the wick should be replaced yearly. This will help make your heater safer, reduce fumes and smoke, and extend the life of your heater. For more on wick safety. check out this helpful article. Kerosene vs propane heaters, what are the pros and cons? There are many benefits and drawbacks to both kerosene and propane heaters. While these are both fuel fed heat sources, they have some pretty big differences. Below, we will take a look, at how they compare. Propane heaters are great for shops and garages. Like kerosene heaters, they come in many different designs, sizes, and specifications. They can be both fixed and portable. Unlike kerosene heaters, propane heaters can be fixed into place and hooked up to existing propane on your property or to a propane supply. They come in many styles, the main ones being radiant, forced air, convection, and mounted. Kerosene heaters are great for use inside and outside. They are also very portable and versatile. These heaters also offer an alternative heat source that doesn’t require electricity. This makes small portable kerosene heaters ideal for emergency heating situations. Kerosene heaters are often seen on construction sites or in other industrial areas. What are the ventilation requirements for safe use? Kerosene heaters use oxygen as they burn. They can reduce oxygen levels dangerously in small areas that aren’t properly ventilated. Differently sized heaters will have different ventilation requirements. Each heater will have safety guidelines that come in the owner’s manual. Read these guidelines thoroughly to find out what the ventilation requirements for your specific heater are. In general, the size of your kerosene heater and BTU rating will determine how much ventilation is needed. If a heater has an output of 10,000 BTU or less, you can usually use it inside with a cracked window or in a drafty space. Any BTU rating above this number will require much more ventilation. Remember, proper ventilation is paramount to the safe use of kerosene heaters. If you don’t have proper ventilation, your health could be seriously threatened. For more on safety, click here. These have been some of the best kerosene heater options available. We hope that at least one of these impressive heaters looks like a good fit for you! We want to know what you think. Did we leave any important options off of our list? Are there any questions that our FAQ doesn’t answer? Please feel free to leave us your feedback and let us know what you think. Thanks for reading, and happy heating!